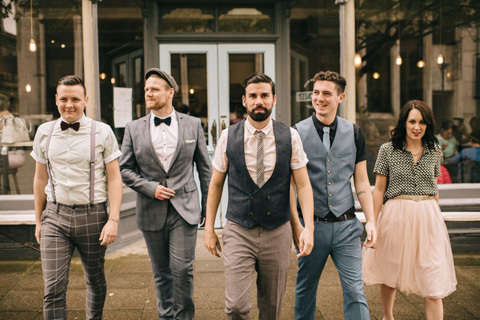 Irish indie-folk band Rend Collective will be at the Lancashire Festival of Hope with Franklin Graham in Blackpool this September. Their latest album, Good News, was released just this month. Band member Gareth Gilkeson sat down with BGEA ahead of a tour in 2014 to talk about organic worship music that celebrates a creative God. It started a few years ago with a misty Irish morning at sunrise. Gareth Gilkeson was watching the ball of light on the horizon when he was suddenly overcome with a feeling of freedom. Gilkeson recently met with BGEA just before a concert with Kari Jobe. Wearing a white T-shirt and his signature hat, he emerged from a tour bus with a big smile and spunky “hello,” then waded through some duffle bags and equipment strewn across the pavement. “We look a wee bit homeless at the moment,” he said before plopping down sideways at a nearby picnic table. Such is life on the road, especially now, just four months into fatherhood with his wife and bandmate Ali, who welcomed little Arthur in December. Gilkeson said his son seems to like their music. And so do thousands of others. So what makes them so likable? So successful? “I have no idea,” Gilkeson said, but tries to answer anyway. 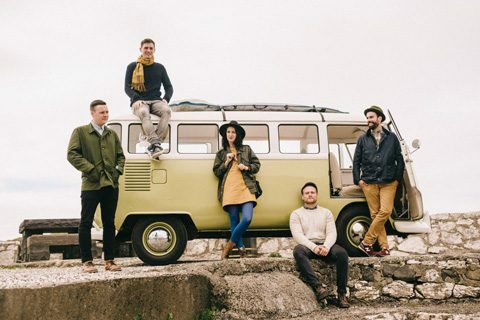 Rend fans relish their refreshing, high-energy, raucous-worship music at a time when some people are bored with church and confused about God. And it’s not just about the music; it’s about worshiping God together. The band is big on community worship. Worship music tends to focus on God’s holiness, Gilkeson said, but doesn’t always take that next step into celebrating it. From left to right: Stephen Mitchell, Patrick Thompson, Ali Gilkeson, Chris Llewellyn and Gareth Gilkeson. It was Jesus Christ who celebrated weddings, attended feasts and rejoices over His people. “Our God is the ultimate artist of celebration, the inventor of the party and the healer of the broken,” Gilkeson said. Yet sometimes, he added, life has a way of stealing that wonder from us. Maybe it’s through failures or disappointments. Maybe it’s through suffering or betrayal. But whatever gets us down, God is there to pick us back up. The video for the song was filmed on the choppy Irish seas. But now, looking back, the band can laugh about it. And that’s the light-hearted, no-grumbling approach they’re going for as they celebrate God and pursue joy.